You are here: Home / gift ideas / Lotty Dotty Shirts: Dress Up the Doll on Your Shirt! 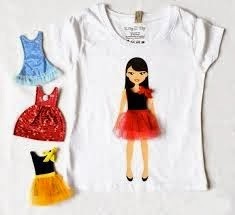 Lotty Dotty Shirts: Dress Up the Doll on Your Shirt! I have finally found the best birthday gift for girls. They are Lotty Dotty high-fashion T-shirts featuring screen printed doll figures, that can be dressed interchangeably with Velcro-backed designer mini-outfits. You literally change the look of one’s T-shirt by using 3D detachable clothiung. You literally change the clothing on the doll on the front of the shirt! It is like having a hundred shirts in one! They also sell tote bags and adult T-shirts with the same concept. Lotty Dotty is a Paris-based clothing company with a brilliant idea stemming from the fond memories of the founders, Shevanne Helmer’s and Maya Persaud’s passion for playing dress up with paper dolls. The company also serves as a showcase for unknown talented designers who create the mini-outfit collections, and are promoted on the company’s website and packaging. Lotty Dotty uses organic and recyclable materials as much as possible and is dedicated to aiding women and children issues. Lotty Dotty’s t-shirts are made of 100% organic cotton and manufactured using green energy from wind and solar power. On each t-shirt your doll will come with a Velcro bathing suit in an array of different colors, which may vary and she will be dressed in a signature bow dress.